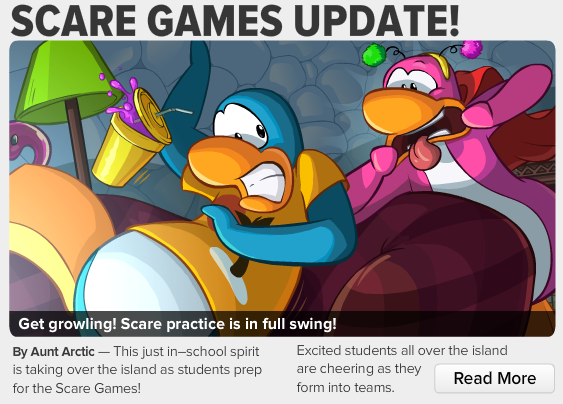 By Aunt Arctic -- This just in-school spirit is taking over the island as students prep for the Scare Games! Excited students all over the island are cheering as they form into teams. Wow! I wonder how the Scare Games will turn out and which team will win. I heard you can get trophies. 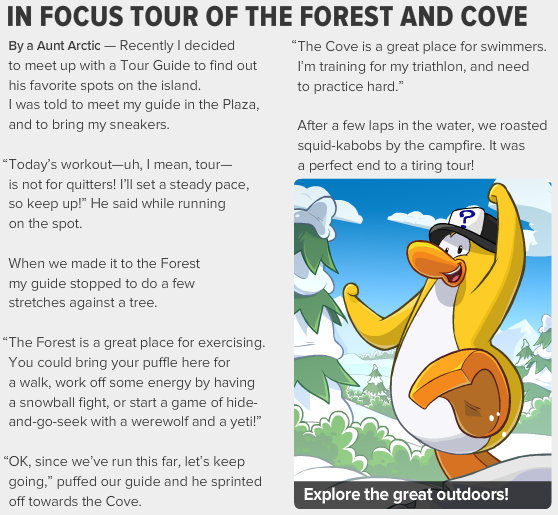 By Aunt Arctic -- Recently, I decided to meet up with a tour guide to find out his favorite spots on the island. I was told to meet my guide in the plaza, and to bring my sneakers. I'm not sure if Aunt Arctic is just telling a story...or if she's trying to hint at something new coming up soon. Leave a comment on what you think that might be. Furniture Catalog: Check out what's new and get decorating your igloo! Scare Games: Unleash your inner monster! Some serious scares are just around the corner! Awesome! What do you all think of the Scare Games? Are you ready? I wonder how Club Penguin Times is going to celebrate their 400th issue? Leave a comment on your idea. I'm excited.